I love good quick breads. Meaning zucchini bread, pumpkin bread: paying $2/slice at my favorite local coffee shops just seems silly when I can make it myself so easily. But the amount of sugar and oil the traditional recipes call for made me want to see if I could do a healthier version. I had read about applesauce being a substitute for oil, so instead of using a whole cup of vegetable oil, I used half oil, half applesauce. This is one of the reasons why I had frozen applesauce in small containers. I thought I'd start out with minor substitutions and see if I could tell the difference, and I'm happy to say I couldn't. The recipe called for a whopping three cups of white sugar, and there's no way I was going to use that much. Instead, one cup white, one cup of brown sugar, and to help enhance flavor, I doubled the amount of spices to punch it up some. And then finally, I've found out the hard way that you can't substitute whole wheat flour for white flour 1/1. Oh no. I tried that a few months back and baked what came out like a granola crumble. The recipe called for three cups of flour, so 2 cups were white, and 1 cup was whole wheat, but I made sure to sift all of the dry ingredients to help aerate it. I read this helps when you're using whole wheat flour, so what the heck. I gave it a go. The verdict? Excellent. 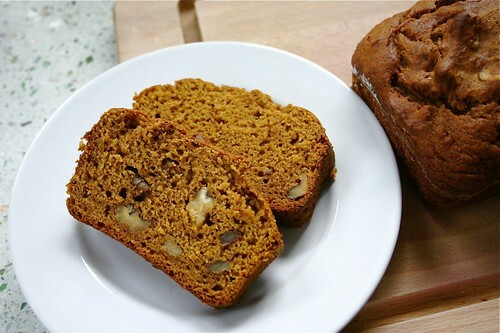 Moist, flavorful, not overly sweet, this pumpkin bread is a keeper. It's a great Sunday afternoon or evening project. The recipe calls for two loafs, and I've sliced and frozen one for quick morning take-aways, with a fresh loaf for this week. Next time I'll try increasing the applesauce even more, but so far, this recipe is a more healthful version than I've used in the past. Preheat oven to 350 degrees. Prepare two loaf pans (I used 8x4x2.5 or so) with butter and flour. In a large bowl, beat sugars, applesauce and oil to blend. Mix in eggs and pumpkin. 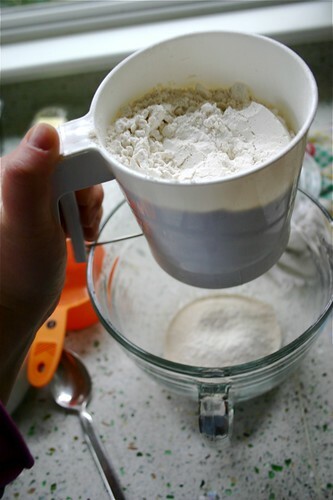 Sift the remaining dry ingredients (flours, cloves, cinnamon, nutmeg, baking soda, salt, baking powder) into another bowl. Stir dry mixture into pumpkin mixure. Mix in walnuts. Divide the batter between pans. Bake 1 hour, or until a knife insert into center comes out clean. Transfer to racks and let cool 10 minutes. Remove from pans and let cool. Do you use substitutes in baking? I'd love to hear your hits and misses. Sounds so good...I would replace the eggs with egg substitute, but this bread looks fantastic!!! Sounds delish! I'll be making this recipe when I cook up the first (and only) pumpkin I've managed to grow. Thanks, baby! Well, I'm not so much a quick breads person, but a good baguette or loaf of sourdough, yum. Luckily there's a reasonably priced and excellent bakery not far from my house. Glad you enjoyed the baking! I've done the applesauce substitution before, but like you, I cut the oil in half and used half applesauce. While I was reading this recipe and realizing that you cut a whole cup of sugar out I was thinking, but what about the moisture-level. Obviously it wasn't an issue with this recipe. That's usually what I have big problems with when trying to cut out the sugar and/or substitute it for Stevia. And then there was the time I tried to develop a hot cocoa recipe using only stevia and no sugar. Never did get that one to work. In fact, I've only been successful using stevia for sweetening individual servings. Something I need to work further on converting those conventional sugar-based recipes to stevia. If I could just figure out a moisture conversion. Eh, maybe tomorrow. BTW, been lurking here for a long time and really enjoy reading your missives. I do substitutes like this all the time. The King Arthur Flour Anniversary Cookbook has a great section dissecting how quick bread recipes work, and discussing possible substitutions, so I use that as a starting point. It looks beautiful. I am very glad you didn't leave out the walnuts, though. They add so much! I may try your recipe at some point in the near future. I'll let you know how it turns out. 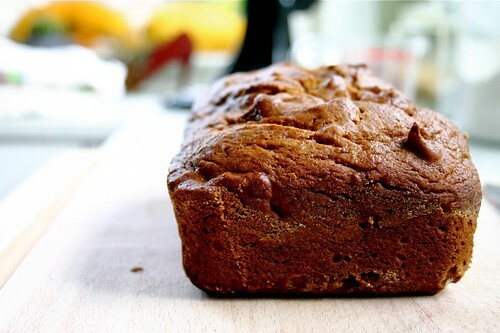 When I bake banana bread I do not use sugar I use honey. It makes the bread moist and so good. yummy! I'm going to have to try this! !